So can you enlighten me on posting pictures? I don't use Photobucket or the like any more but can copy codes from Facebook. Use resize image.net, upload an image, then under "resize image" set maximum dimension to 1280 (of the two dimensions available, the other will adjust automatically if you have "aspect ratio" ticked). Under "optimize your image" select "normal compression" with image quality at about 90% then "resize image". Download to your device and then use "choose file" on your retro bike post to upload the file from the location you downloaded it to. If retro bike reports the file is too large resize again but reduce "image quality" to a lower %. Needs to be below 512MB, I think. That is so bad it is good! I have a mind to build something along those lines. Here are 2 of my winter possibilities. As you can see below I have 2 classics but in bad weather, like today, I prefer my more modern Boardman because it's better protected from the weather. Also I don't have the same emotional attachment to the Boardman. I thought today that the SRAM 1x11 doesn't perform as well in grotty conditions as my 10 speed Shimano. Maybe the cogs are just too close together? I was thinking that about my 10 speed today, shame I just broke up my 8 speed Orange O2 in pursuit of something more exotic! I went out on my Boardman today and no amount of adjustment was making the transmission happy. I jumped off and gave it a long hard stare. I soon noticed that the rear wheel bolt through axle was loose. Tightened. Problem solved. I do think SRAM is more sensitive to cable tension in general, though. I also had a mere twig breaking 2 teeth from one of the cogs last summer. Something I've never had with Shimano. Kona Kaboom Singlespeed. Exotic front fork, White Industries freewheel on Phil Wood hub. It's all bombproof kit requiring little more than brake blocks and the odd new chain. I've switched to a disc front (Magura MT2) this year after getting the bits cheaply over the summer. Winter bike. Being used in winter. Well, didn't use it that day, as it was a bit wintery. 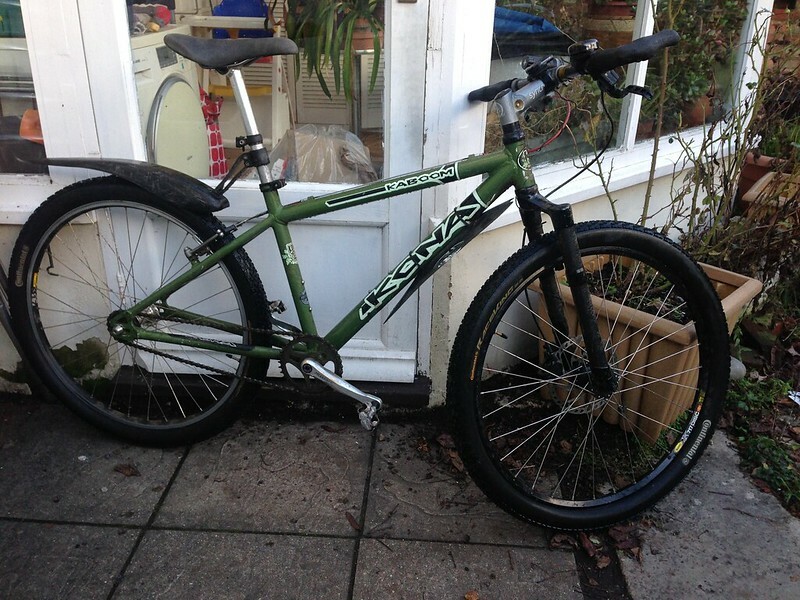 10 year old massively discounted on-one (80 quid i think) with whatever bits i could find in the parts bin. It's got a Magura fork on it now. Other than that, pretty much unchanged in the last 10 years. I took this photo while we were digging our way round the house so we could get to woodshed and garage etc. I had to go out later in the morning to retrieve the car, which i'd abandoned half a km down the road in a deeper patch of snow (it'd floated into a drift). By the time i got back to it, it'd completely disappeared under the snow, quite unusual for a fire engine red Volvo estate, had to get it dragged out by the village snow plough in the end. Only day i've ever taken off work due to the snow. That's what the picture was for, to send to my boss as evidence (virtually no snow where the office was). Class! We have a yellow warning for snow on Saturday - probably come to nowt.